At Marketo’s Marketing Nation Summit last month in San Francisco, there was much talk about the shifting function of marketing towards a more strategic, data-driven role within the modern corporation. You see similar sentiments echoed throughout the marketing press. Marketers are no longer the “arts and crafts” people, we’re told. Marketers are strategic players, contributors to the bottom line, demanding of a seat at the “revenue table”. As someone who’s worked in B2B marketing for more than twenty-five years, I need no convincing that marketing has taken on a more strategic, measurable role in driving corporate success. However, I’m also concerned that, as marketers, in our haste to throw off our reputation as a bunch of do-nothing artists, we run the risk of relinquishing a creative legacy that still has an important role to play, in demand generation, and in marketing as a whole. Sure, data rules the roost. Where once, good creative was everything, much of being an effective B2B marketer today means mastering relevancy, personalization, segmentation, predictive analytics, even knowing what your customer needs and wants before he knows it. But is data all that’s needed to drive B2B marketing success? I don’t believe so. But none of this renders creative unimportant. Good data ensures that you’re marketing to the right people at the right time. Good content ensures that the information you’re offering is topical and relevant. But all those things being equal, good creative is still the ultimate competitive advantage. Conversely, even the best data and the perfect offer can be undone by subpar copy and design. 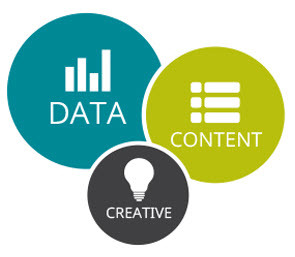 When it comes to marketing success, data and content are simply the foundation. Creative is the “secret sauce” that sets one campaign, one white paper, one ebook, one Webinar apart from another. At our agency, we help clients clean up marketing data, develop segmentation strategies, and build compelling content because we know those are the minimum requirements every client needs to be effective. But it’s the creative we deliver – a catchy subject line, compelling visual, attention-grabbing headline, copy that drives action at every step – that more often makes the difference in driving campaign performance. This entry was posted in B2B Marketing, Campaign Strategy, Creative, direct marketing, Direct Marketing Agencies, Marketo and tagged b2b creative, b2b demand generation, B2B demand generation agency, B2B Marketing, demand generation agency, demand generation creative on May 11, 2015 by Howard Sewell.